Geraint Jones Carpentry | Carpenter Newcastle Emlyn & Cardigan – Carpenter and Builder West Wales. Free Consultation and Quotes. No Job too BIG or small. This includes first and second fix carpentry on new build homes, renovations, extensions, loft conversions, wooden flooring, garden fencing and decking, bespoke joinery including stair cases, windows and doors. We can design your kitchen to suit all budgets, whether traditional or modern. We can also create bespoke storage units and fit all types of work tops including solid wood, solid surface, acrylic and granite. We can design, supply and fit all types of bathrooms, ensuites, wet rooms and WC’s to suit any budget. 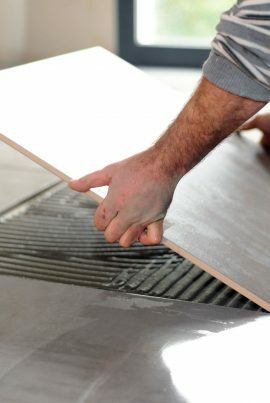 We can undertake any type of floor or wall tiling work, from bathrooms, kitchens or floors throughout a home. We supply and fit a range of electric underfloor heating systems for bathrooms, kitchens and any other room you may require. Suitable solutions for all budgets. Whether you require a brand new roof on a new build home, refurbishment or a leak repair, we can undertake all types of roofing including, pitched, flat, warm roof and cold roof construction. If you are thinking of making a home improvement, need a repair made or are building an extension or new build, please get in touch for a friendly, free, no obligation consultation and quote. Gwaith Saer Geraint Jones Carpentry is based in West Wales and has over 15 years experience in Carpentry and Building. From new builds to old building restoration projects, we have carried out all types of building work across West Wales. If you would like any more information about our service or would like to discuss a project, please don't hesitate to get in touch. "Geraint came recommended to us by a floor tiler we were using nearly two years ago. We had a lot of work to do on our bungalow and Geraint has done all of it for us. He has put in a new kitchen and revamped our bathroom, laid wood flooring in the lounge and hallway. Changed the front door, kitchen and lounge, moved and changed radiators. We have been very pleased with the standard of his work, he is easy to have around and is very reliable. I would recommend him for all of these jobs and more." "My new bathroom looks like something out of a showroom! Thank you so much Geraint." "Geraint Jones has completed carpentry, tiling and various other jobs on my house over the last couple of years. He has very high standards and has always completed an excellent job for a reasonable fee. I would recommend Geraint highly to anyone who asked."